Although the heat exchanger is only one portion of an entire HVAC component, it is a part of utmost importance to the intricate operation of even the most basic of furnaces. Whether or not a furnace operates on oil, gas or even wood, the heating of air is a necessity and, typically, a fuel is burned. At the mention of burning fuel, the last thing you want to think about is the burning of a contaminated item. For this reason, heat exchangers need to be kept free of dirt and debris. A very common heat exchanger consists of, typically steel, cylinders into which fuel is ignited. The combustion of the fuel creates energy, or heat, as well as vapors. The steel cylinders heat up and while this heat begins to warm the air surrounding the steel tubes, or heat exchanger, the vapors are drawn and forced out of the building through flue piping or ventilation. Meanwhile, the newly generated warm air is blown through a duct system by the unit's fan to warm a home. Obviously, this is a very simplified description of a heating unit, but the point to make clear is that when sending fuel into the heat exchanger to be ignited, you do not want any blockage from debris. When manufacturing a heat exchanger, there is likely to be metal forming or metal stamping and in the process there are chances of trimmings or small matter getting into the tube. If any item falls into the cylinder and lodges in such a way to block the flow, great efficiencies could be lost. Often during the assembly and installation of heating units dirt and weld beads easily slip into tanks and piping. Nuts and bolts could haphazardly enter the cylinder blocking the effectiveness of the heating process. Another concern would be the particle itself. If a flammable liquid was allowed to get inside the heat exchanger, it could explode, or emit bad fumes into the atmosphere. Paper or debris would burn leaving unclean ashes. This could cause a form of condensation leading to corrosion and destruction of the heat exchanger walls. A weakened wall could spell disaster as the vapors which should be directed through the flue to the outdoors could leak through a cracked heat exchanger. The material used to make a heat exchanger is important. Many are stainless steel, which is tolerant of many chemicals found in manufacturing facilities today. However, stainless is not very friendly with chlorides and can be broken down. This is another situation that creates a worn or corroded wall, through which the harmful vapors could transfer. Some industries require in-house cleaning of Vinyl, Rubber and Plastic Plugs and Caps for the HVAC Industryequipment with heat exchangers and it is important to know what cleaning fluids are compatible with the components. In the HVAC industry these concerns are addressed by a simple solution. Cover the open ports. Cover the open ends of the cylinders or plug them with protective covers. Using common stock caps or plugs, most of the issues mentioned above are easily prevented. On the surface, plastic caps and plugs appear a minor piece of the puzzle, but HVAC design engineers know a simple protective cap or plug could mean thousands of dollars in preventative measures. 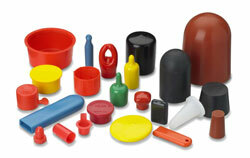 Plastic caps and plugs are instrumental in defending heat exchangers from harsh elements. Like the design engineers, StockCap knows the importance of safeguarding HVAC components from dirt, dust and moisture. For over 50 years, StockCap has supplied the HVAC industry with plastic end caps, vinyl caps, tube end caps, tapered plugs and rubber seal plugs, which work extremely well with copper tubing often found in HVAC units. To assist HVAC design engineers, the StockCap website displays the best options specific to each major component. The StockCap online store provides smaller quantities to help during the prototype and testing phases of component design.